Seasonal Foods — Good, Good, Good | Eating well, with creative recipes, to follow the Fasting Lifestyle according to Michael Mosley's "Fast Diet." No particular theme for this post, simply good recipes which are good to eat. They are also good for you. In Albuquerque now they are roasting green chiles, so the breakfast is rather seasonal. Fresh cherry tomatoes for the dinner are probably still in your garden or at your favorite farm stand. Apples and natural apple cider should be widely available now. 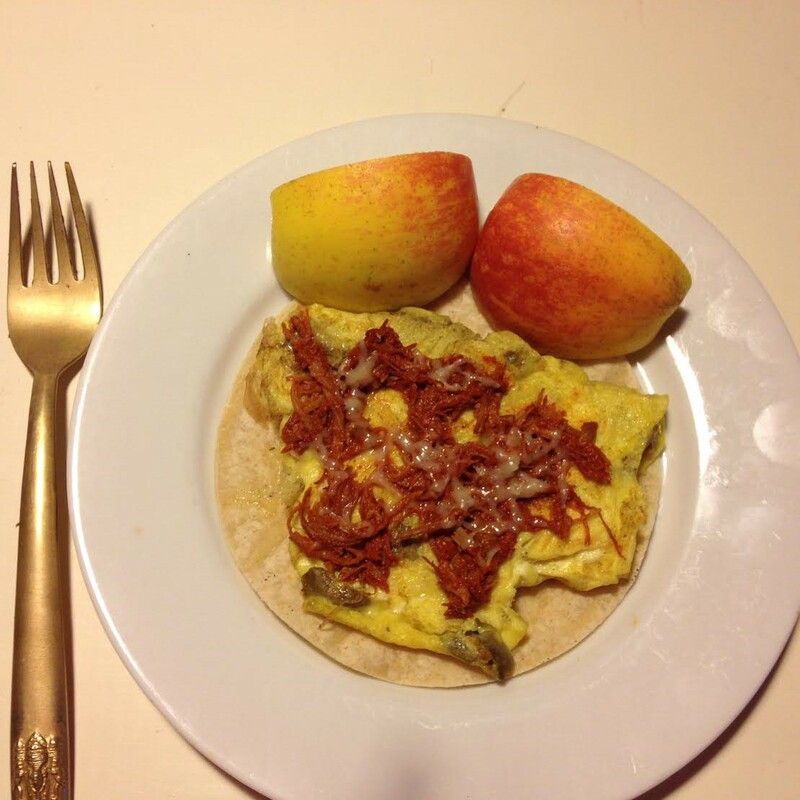 Breakfast Burrito 291 calories 11.9 g. fat 18.7 g. protein 38 g. carbs GF Inspired by breakfasts enjoyed at the Frontier Restaurant in Albuquerque, N.M., this has all the tastes of the Southwest in a filling yet low-calorie meal. Whisk the egg with the chiles and carne. Heat a dry, well-seasoned cast iron pan and heat the tortilla until it is warm, soft, and just beginning to brown. Remove to a plate. Scramble the egg to your preference in a spritz of oil on your pan. Put the egg on top of the tortilla. Sprinkle the cheese on the egg and put it all in the toaster oven for about a minute. Douse with hot sauce if you wish, serve with the apple, smoothie, and hot beverage of your choice. Spritz a small oven-proof pan with olive oil or non-stick spray. Put the salmon in the pan and sprinkle with seasonings of your choice. 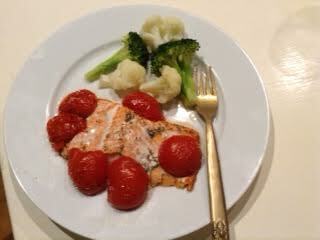 Arrange the tomatoes on/around the salmon. Bake at 400 degrees for 10 minutes. Meanwhile steam the green vegetables. So easy. So yummy.